The Women in Leadership (WIL) Committee is pleased to invite you to the WIL Networking Event in New Orleans entitled “Presidential Perspectives Panel”. 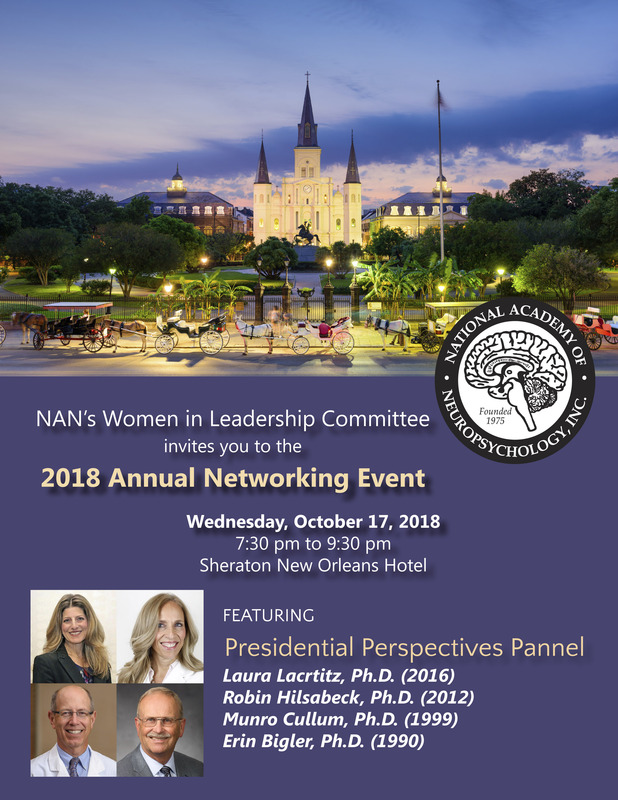 This panel will bring together the unique viewpoints of past NAN Presidents, both female and male, for an evening of insightful discussion, personal reflection, and a bit of collegial banter through a moderated Q&A spanning issues of gender, leadership, and the past and future of the field of neuropsychology. Panelists include Laura Lacritz (2016), Robin Hilsabeck (2012), Munro Cullum (1999), and Erin Bigler (1990). The WIL Networking Event is a wonderful opportunity for conference attendees to network as we continue to support women within our profession and encourage those who are seeking greater opportunities for leadership. Complimentary hors d’oeuvres and beverages for purchase will be served. Reduced fees are available for pre-doctoral student members. Purchase your tickets early as space is limited! Become a Benefactor - Sponsor a trainee for this event! Non-Members are welcome as well - complete the ticket order form today!